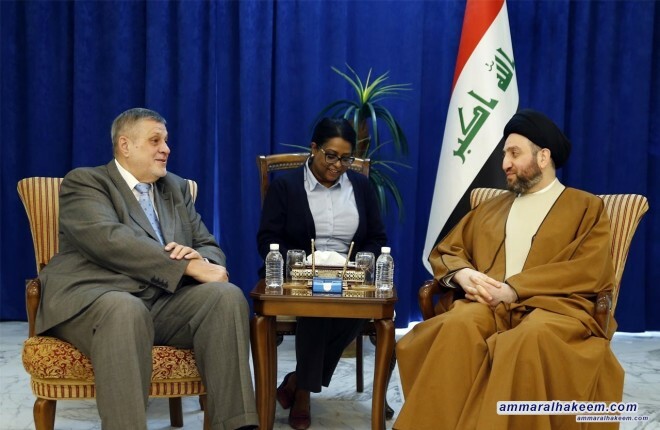 Head of the Reform and Reconstruction Alliance, Sayyid Ammar al-Hakim, in his office in Baghdad received Representative of the Secretary-General of the United Nations in Iraq, Jan Kubic Wednesday 28/11/2018 His eminence emphasized the importance of the three presidencies harmony to country advancement and to achieve the desired reform, reiterated support for the government in implementating the government program. His eminence with Kubis discussed the political situation in Iraq and the region and the completing the government cabinet, affirmed his sustained harmony between the three presidencies and government's support to implement the government program, the advancement of services and the fulfilling requirements of the Iraqi people. His eminence also pointed out that the Reform and Reconstruction Alliance is moving forward in institutionalization steps as it is an important step to enhance political stability in Iraq, stressed the need to complete the formation the Alliance's committees on various fields. In respect of Kubis end of mission in Iraq, his eminence expressed gratitude for Kubis efforts and the UN mission in Iraq. Kubis congratulationed Sayyid Ammar al-Hakim for being elected as head of the Reform and Reconstruction Alliance. And presented a brief regarding his visit to the Security Council and submitting his report on Iraq and formation of the government.